There are two types* of people in this world: the first believes everyone's lives are inherently interesting and the second is Nicholas Carr. Yes, it is a terribly narcissistic mistake to believe that anyone gives a flying snake about what you ate for breakfast (it was Mintz Blintzs from Trader Joe's and they were amazing, btw) or any other thing one 'inanely' utters. But that isn't really the point. In fact a 'stream of consciousness', whether in the form of Tweets, posts, photos or any other artifact of our day to day life isn't really for anyone to consume. Well, not in this era anyway. It's more of a mark of our having been here. A legacy, if you will, of our lifetime. Something for our grandchildren to look back at and see how we lived. "We are recording our histories one blog post at a time." "wondering how future historians will contextualize all of our digital musings. can only imagine future biographies with quoted twitters..."
And this is probably where I differ sharply from the Nick Carrs of the world. I don't believe history should be written by a handful or curated by some sort of popular notion of 'success' or 'relevance'. I don't find the breakfast of a teenage girl inane information to record publicly. I don't find a tweet of general boredom or frustration a waste of time. I certainly don't find opinions of any sort, informed or not unimportant to broadcast. Sure, right now they may seem like a helluvalotta noise to deal with, but as Ms. Myronuk alludes, historians will have a great deal of material to create a very rich context of our time. The only pity is that we are still at the interstices of public/private where there are those who either don't choose to add their experiences to the record or who don't have the opportunity to. For centuries, history has been recorded by the few of a few. We have lost many lifetimes of important stories, especially those of women. I bid that each and every one of you record your stories: your thoughts, your accomplishments (no matter how big or small), your dreams and your points of view and trust them to future generations. I was so moved by Eli's passion for this and agreed strongly. I knew that my late Oma had enjoyed many an adventure in her lifetime. Stories that I would often as a young girl roll my eyes at and complain, "I've heard this one." All of a sudden, these stories seemed incredibly valuable. That very day, I sought out a recording journal called All About Me and presented it to her that evening. I explained to her that I would like her to fill it out as much as possible. She also revealed to me that she had 80 years worth of diaries, most of them in Dutch. My mom and I keep these safe to this day. That, more or less, is how the story would run, I think, if a woman in Shakespeare's day had had Shakespeare's genius...it is unthinkable that any woman in Shakespeare's day should have had Shakespeare's genius...Yet genius of a sort must have existed among women as it must have existed among the working classes...When...one reads of a witch being ducked, of a woman possessed by devils, of a wise woman selling herbs, or even of a very remarkable man who had a mother, then I think we are on the track of a lost novelist, a suppressed poet, of some mute and inglorious Jane Austen, some Emily Bronte who dashed her brains out on the moor or mopped and mowed about the highways crazed with the torture that her gift had put her to. 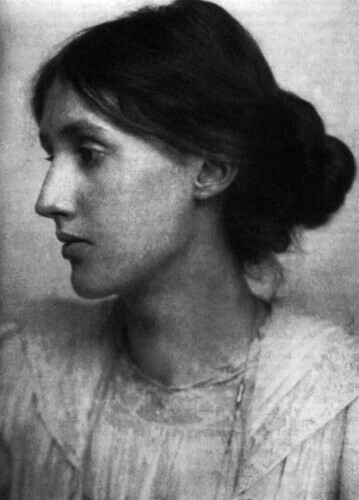 Of course, Woolf was a horrid classist, denying that genius could be found in the working class, but you get my drift. Many stories have been lost over the centuries because of assumptions, narrow ideals of what 'genius' is, and the very fact that 'genius', a relative term defined by a few, is the yard stick for recorded history. But today more people than ever are able to be publishers. Because of the internet. Publishing platforms. Various crazy tools that make it easier and easier for those of us who have anything to say (worthy of reading or not in whichever opinion exists). And we write and photograph and video and podcast and create gobs of content that historians can look back at someday and glean various threads of existence. Memes. A rich tapestry of lives. Not that boring, monolithic mass of hegemonic crap that we think is history. Why do you think we keep repeating the same mistakes over and over again? It's not merely because people are historically myopic, it's because historical evidence as it is presented is full of holes, missing experience, context and depth. It doesn't connect with us. No, Twitter isn't some big savior of history or some comparison to the brilliance of historical figures like Woolf, it is merely a tool (140 characters at a time tool). The amazing thing about Twitter is that it has a great, low barrier to publishing for me and many others. The printing press was a tool that started to democratize the publishing of information and the internet made this even more possible. Blog tools, video & photo sharing, and whatever is coming in the future are very important factors in the richness of the recorded history. (interesting to note, though, that Ev Williams has been involved in many of these platforms...it would be interesting to hear if he has any personal stake or passion about democratizing historical recording). I mean, really, the only truly certainty we have is death, right? Morbid thought, but currently accurate (personally, if given the choice to live forever, I'd decline). With you will die your consciousness...unless you record it and pass it along. And, hell, maybe nobody will ever give a flying snake whether you've done that or not, but I'm venturing a guess that someone (even if it's only one person...your great great great grandchild) will. Personally, I was and still am extremely hungry to get to know more details about my Oma's existence. Some of her diary entries are so vague. Some talk of meals. I take those snippets and her photographs, etc. and string together an imagined picture. The more information I have, the closer I am to an accurate picture and that is incredibly important to me. It's a pity we get so caught up in our immediate desire for fame and ego boosting that we don't realize that, in the long run, we are collectively contributing towards a much better future. Instead of duking it out for the top of the pops, we need to concentrate on building more attention tools to start to understand our world better. It's not about you or me. It's about us and them.